With about four months to go until our big day, we sent out our Save the Dates a couple weeks ago. Can I tell you that using Paperless Post for these was the best idea I've ever had? And I'm not being paid to say that, although, Paperless Post, if you're out there, I'm more than open to taking some cash! You can see the design we selected above. 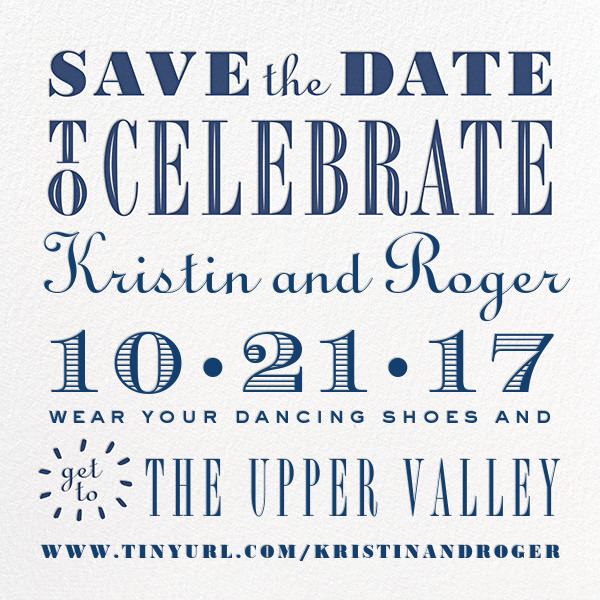 We were originally hoping to letterpress our invitations at the Dartmouth Book Arts Studio, so I wanted something that looked kind of fun and typographical to match. We, uh, bought a house in the meantime, so that plan has fallen by the wayside, but I'm really happy with the design and since we've just picked out our invitations, I can say that they still have the same feel. I am someone who wants everything to match, so it's kind of fun to force myself out of the comfort zone and do mismatched stationary for the wedding. I was mildly concerned that some of our guests (particularly some of my older family members) would have trouble opening or understanding the email, but the tracking on there tells me that of the 65 we sent, 62 were opened, and about 25 people even realized they can send us their address through the system. The tracking was amazing for me to have because I'm always paranoid about people not getting mail, and of course most people don't respond to mail anyway, so having this as a way to see who had seen it was wonderful. We're having a somewhat casual wedding, so email felt totally fine to me, and for pretty much every single person but us, it's a destination wedding, so we had a lot of information to convey, and having our website featured so prominently was helpful. I'm so pleased with how it turned out. Plus, the tracking also allows people to send us their addresses, which will help keep everything neat when it comes time to address our invitations. I'd also do the invitations via Paperless Post because they make it SO easy, but I love stationary and paper mail, so I'm taking the opportunity to do a beautiful paper invitation instead. I'm looking forward to framing it under a photo from our wedding for our first anniversary. But, if you are a person who does not care about such things, a Paperless Post invite is 100% the way to go. It saves so much money and still gives a beautiful introduction to your wedding day.